It should come as no surprise that the proclivity for roasted meat is particularly strong in the American West. Wyoming knows a good barbecue. So whether you’re searching for brisket, pulled pork, or a rack of ribs, Wyoming has it. Here are the best barbecue joints in the state. The self-proclaimed Wyoming “headquarters” for savory smokiness, HQ certainly delivers the goods: and they’re all hickory-smoked, in-house. Though this joint sports the most important trait (delicious barbecue), its approachability and accessibility are equally attractive. The proximity to the highway and the speedy, friendly service make for an enjoyably commitment-free meal, within easy reach, be it for a traveling family, hardened trucker or local commuter. A host of yummy fried goodies and typical accoutrements get the engine running, but the savory, sauce-slathered and dry-rubbed entrees are the reason to visit. Go for the ribs or prime rib, or ideally, both. “Buffalo’s BBQ & Brew” hub for nearly 10 years, Up in Smoke has managed to compete with the scenery and historicity of Buffalo with mouthwatering smoked protein. And aside from some delicious meats, diners here can rest easy in the assurance that the product here is fresh, as local as possible, and sustainably sourced. The owners take these ideals to heart: they’ve lived off-the-grid for years. This attention to ecology and responsibility translates to well-crafted and happily-served food, most of which is grade-A organic. The way to go is the combo plate: the brisket, buffalo brats, and pulled meats (chicken and pork) are all stellar. And the baby back ribs are equally scrumptious, if not a little messy. If an otherwise unassuming barbecue joint in rural Wyoming wins competitions in Texas, the mecca for all things beef, they a memorable meal isn’t far off. Fat Racks attracts travelers and locals for its execution of two things perfectly well: good barbecue and unpretentious ambiance. This is an classic food truck focused on the important part: the meat. And the Texas-style smoking and saucing rules here: the ribs and brisket are absolutely great, slathered in a sauce more tomato-y and sweet than its mustardy or vinegary cousins. The best side dish to barbecue this good is the house stuffed baked potato: full of bacon and cheese and love. Pokey’s in Gillette is one of the well-known treasures that remains undiscovered. Those locals who know, know it’s good. But it’s amazing this barbecue joint (and a few others) is relatively unknown in the West, let alone America. The menu is well-executed without becoming sterile in its modernity. The apps and entrees remain true to the humble roots of barbecue, but are well-presented, expertly-cooked, and can cater to a kaleidoscope of taste preferences. The fried green tomatoes and okra are excellent, authentic starters, preceding standouts like St. Louis-style ribs and the savory-the-nth-degree smoked pork chop. Even better, this establishment is a successful caterer as well, able to feed any number of parties, work groups and family celebrations. This cake has great icing, too. The long salad bar, framed by the warm pine woods and old-world copper ceilings, are immediately welcoming; comforting, even. For 35 years, this barbecue institution has pleased well-seasoned locals and demanding passers-through with conviviality, ambiance and above all, well-smoked and still-moist cuts of meat and poultry. This restaurant boasts some delicious breakfasts and lunches, but the barbecue dishes are the star of the show, all served in true southern fashion: unpretentious, heavy-sitting and a prime balance of salty-sweet. Standouts here are the pulled pork and beef brisket. Started in neighboring Idaho, in the “border town” of Victor, this two-store venture melds young hearted modernity (sleek design, signage and flavor combos) with tried-and-true processes from America’s culinary heritage. Given this eye towards the future, and the trendy demands of the Jackson Hole area, the meat here is smoked to perfection, bookended by a number of novel sides and alternative entrees for those feeling adventurous (or obnoxiously healthy). In addition to the staples, the menu is as likely to have grilled fresh fish and local veggies as chicken glazed in sweet and spicy purees. But a unique asset at Big Hole, and a relatively new item at the store, are the smoked wings: they’re well balanced between fat and smoke, and retain their crunch from kitchen to table. Like any self-respecting barbecue joint, Boomer’s makes its menu from scratch. From its meat glazes to its desserts: they all have that inimitable, homemade flavor of food made by Grandma’s hands (assuming that Grandma was a great cook). But unlike authentic southern food, for better or worse, and actually attractive to the health-minded public, this restaurant doesn’t fry anything. That said, this house-made mentality carries over into two of the menu’s highlights: the ribs (sweet, saucy, appropriately smoky) and the bread pudding (moist, satisfying, not cloyingly sugary). The name says it all: meat is king here. Approaching 20 years, this company gives an approachable and satisfying Western experience: meat, fire, hospitality and lack of pretension. The Rib & Chop House is technically a steakhouse, focusing more on the grill than on smoking: the prime rib and ribeye attract carnivores from around the state. 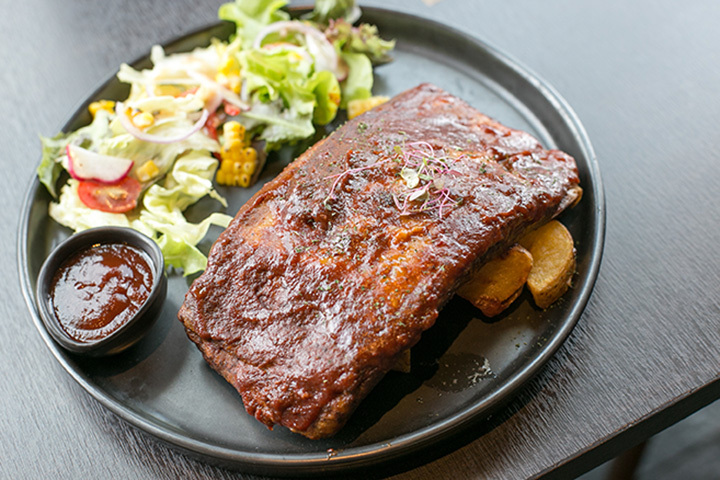 But that doesn’t mean there aren’t some barbecue staples to fill the gap (all be them not house-smoked): baby back ribs, grilled pork chop and sides like baked beans and sweet potato fries will all hit their mark. Find locations in Cheyenne, Cody, and Gillette.